The Indian Ocean is an immense sea, not the biggest on this planet, but certainly one to immerse and get lost in. That is an image that presented itself to me rather vividly listening to Indian Ocean for the first time. The relaxed music, that tickled all sort of pleasant, musical memories is just the sort to get lost in for the length of this album. To just close the eyes and forget about everything around me. The invitation was happily accepted. I put on my headset, closed my eyes and did nothing but enjoy Indian Ocean. Frazey Ford is a Canadian singer-songwriter living in Vancouver, B.C. (That's review three from Vancouver just this year!) She is/was? part of The Be Good Tanya's, a band that is dormant since the middle of the last decade. After 'Obadiah' (2010) Indian Ocean is her second solo album. Having missed everything she has released so far, I can listen to her new album with fresh ears. The first thing to write about Indian Ocean is the extreme laidback character the album has. The tempo is at best mid range, with relaxed singing and a J.J. Cale atmosphere, where the up tempo songs are left out. The sound is open, spaced as if there is a physical distance visible between the instruments. Horns sound through in all the right places. The second thing is Frazey Ford's voice. A Janis light. She has that same rasp, but the one that remains under control all of the time. The same sort of pleasant hint of roughness as Karen Jonas can put into her voice. The third thing is that I have to be in the mood for this album. I've noticed through the days that there are moments that I would like to kick Ms. Ford into action. Of course that just means that I need to put on another sort of record and return later, right like at this moment on a Sunday afternoon. The weather is greyish, cold and not much else to do than relax and enjoy Indian Ocean in all its beauty. The story behind Indian Ocean is an interesting one. Frazey Ford collaborated with the people who played behind e.g. Al Green and Ann Peebles in the 70s, Charles Hodges (organ), Leroy Hodges (bass) and Teenie Hodges (guitar), creating a form of music she describes as country soul. 'You got religion' even goes further back in time. There are Sam Cooke overtones in this song for sure. The beautiful arrangement is captured in a superb way by the producer duo Ford and John Raham, also the drummer on this album. It seems that Frazey Ford jumped far across her shadow and combined the best of both worlds in a superb way. Vancouver country meets Memphis soul of the Hi Records label. 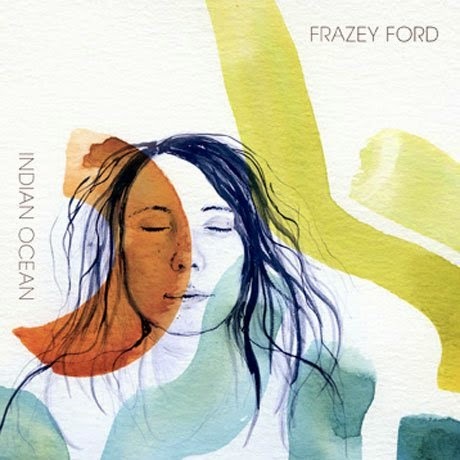 If anything Frazey Ford manages to hit the right note all over Indian Ocean. Anyone in the mood for an album that catches laidbackness in all its glory is recommended to go out and buy this album without bothering to listen first. They do not come much better than this. Via Twitter came the following response: "Nonono, Frazey isn't Joplin, Jonas, or Franklin. She is the great Frazey Ford. Period." by @bgwinettem.